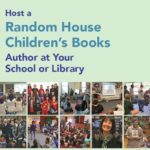 Thank you for expressing interest in having one of the Random House Children’s Books authors and/or illustrators for an appearance at your school or library. You will find everything you need to host a visit below. Will you be ordering books for autographing?